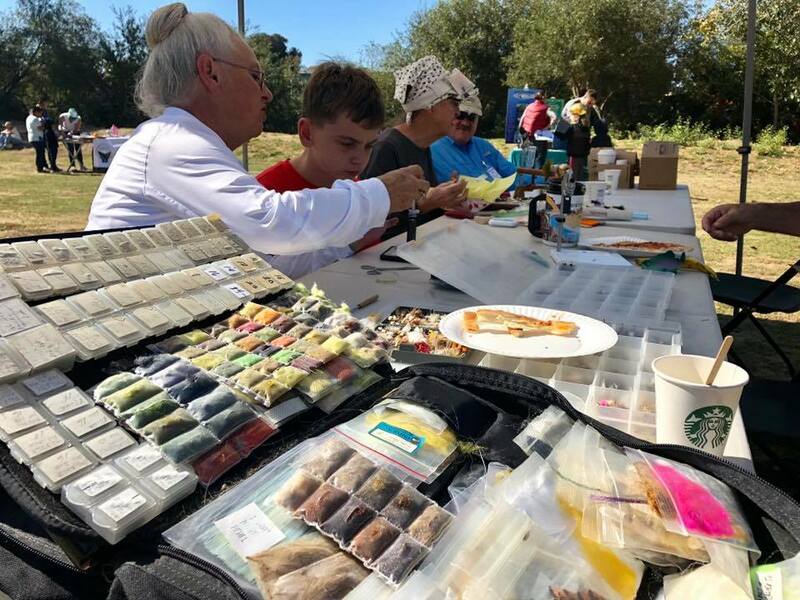 Every year, hundreds of thousands of adult Chinook salmon race upstream to their spawning grounds in the tributaries and mainstems of the Sacramento and San Joaquin rivers. 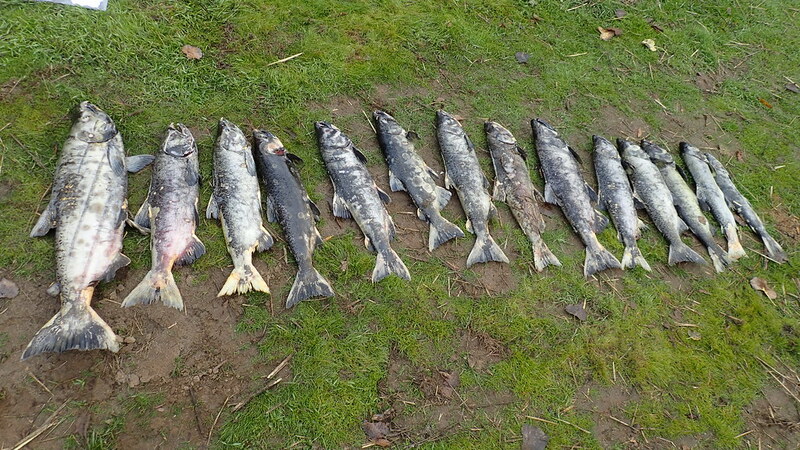 But sometimes, salmon get mixed up about which river they should return to for spawning. Following the 2016 fall-run migration season, we shared our surprising results of adult salmon monitoring on the Stanislaus and Tuolumne rivers. Despite the intense drought that began in 2011, and the underwhelming ocean harvest for the 2016 season, we saw a record-breaking number of salmon return to the Stanislaus River, and the second largest return we’d ever recorded on the Tuolumne River. During the 2017 migration, returns of fall-run Chinook to the San Joaquin Basin made up 32% of total Central Valley escapement, which is triple their usual contribution. We had a hunch that this influx of fish was due to salmon straying from other rivers, and, based on the proportion of returning adults with clipped adipose fins, it seemed likely that many of these fish were from hatcheries. Recently, we crunched some numbers that helped reveal the true scale of hatchery influence on salmon returns in the San Joaquin basin. Figure 1. 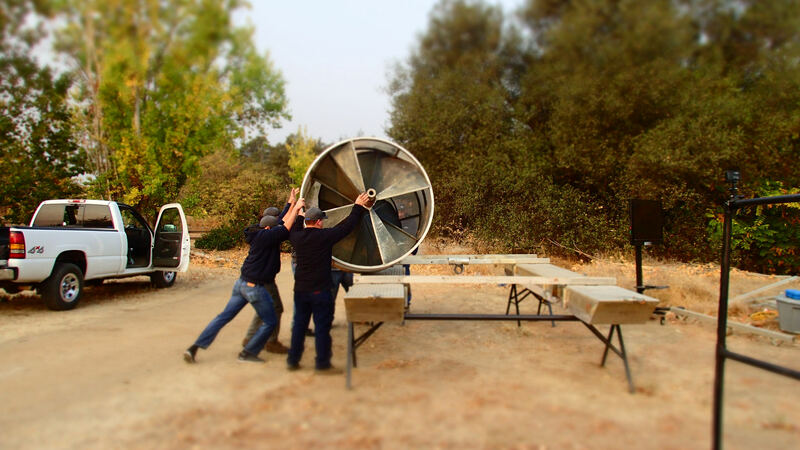 Fish hatcheries in the Central Valley, CA that produce fall-run Chinook salmon. Determining how many salmon came from hatcheries, and which hatcheries they came from, is not an easy task. For one reason, the only external mark given to hatchery-origin fish is a clipped-off adipose fin (a small, fleshy fin behind the dorsal fin), but this mark is not unique to any specific hatchery (they rely on microscopic coded-wire-tags (CWTs) embedded in fish snouts for that). A second reason is that the five California hatcheries that produce fall-run Chinook (Figure 1) only mark about 25% of the fish they release. This means that even if an adult’s adipose fin is intact, it could still have come from a hatchery – for every hatchery fish with a clipped adipose fin, there are about three hatchery fish with unclipped fins. In spite of these challenges, and thanks to the Constant Fraction Marking/Tagging Program, it is still possible to provide a statistically valid estimate of the hatchery contribution to adult salmon returns (Mohr and Satterthwaite 2013). CWTs are recovered during annual carcass surveys as biologists from the California Department of Fish and Wildlife (CDFW) collect heads from recently deceased salmon on or near their spawning grounds (we also collect salmon heads from carcasses that wash up on our weirs). At the Ocean Salmon Project’s lab in Santa Rosa, the code on each recovered CWT is read and submitted to the Regional Mark Information System, the go-to source for information about tagged and marked fish throughout the Pacific region. Because each CWT code is unique to a particular group of fish released from a particular hatchery, we can calculate the proportion of recovered CWTs that came from each hatchery (Figure 2). Figure 2. Hatchery origin of coded-wire-tags recovered from annual CDFW carcass surveys on the Stanislaus and Tuolumne Rivers. Note that these are proportions that do not reflect the different number of tags collected in each year. Combining CWT recovery data with information from CDFW carcass survey reports, we are able to estimate the proportion of returning adult salmon that originated from Central Valley hatcheries (Figure 3). 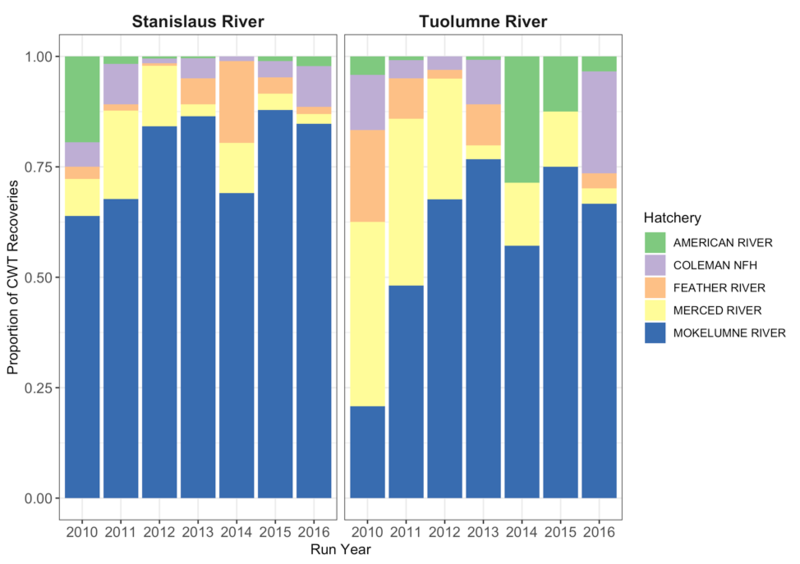 CWTs recovered from the Stanislaus and Tuolumne rivers from 2010 to 2016 revealed that a high proportion of the salmon came from the Mokelumne River Hatchery and the Merced River Hatchery. But we also frequently encountered fish from across the state, including Coleman National Fish Hatchery on Battle Creek, Nimbus Hatchery on the American River, and Feather River Hatchery (Figure 2). 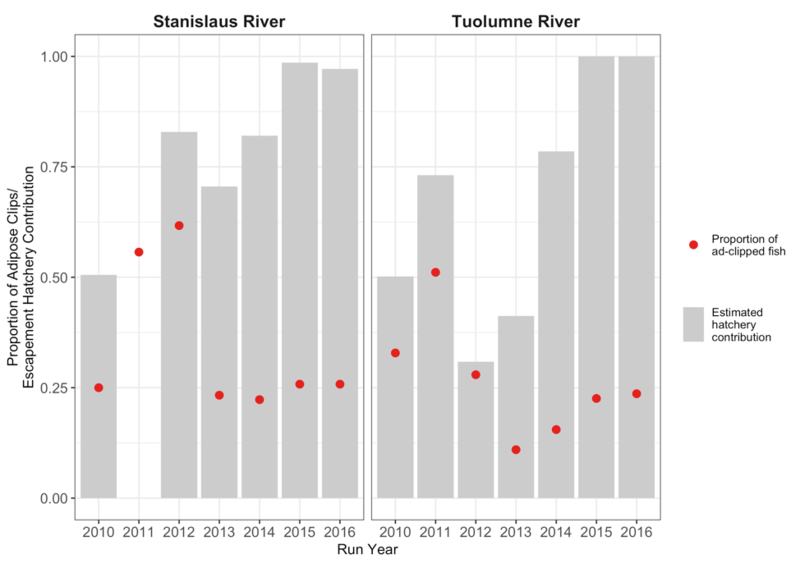 Since 2010, there has been a greater than 50:50 chance that a returning adult salmon we observed on the Stanislaus or Tuolumne River came from a hatchery. In both rivers during 2015 and 2016, almost 100% of those record-setting numbers of salmon came from a hatchery. Figure 3. 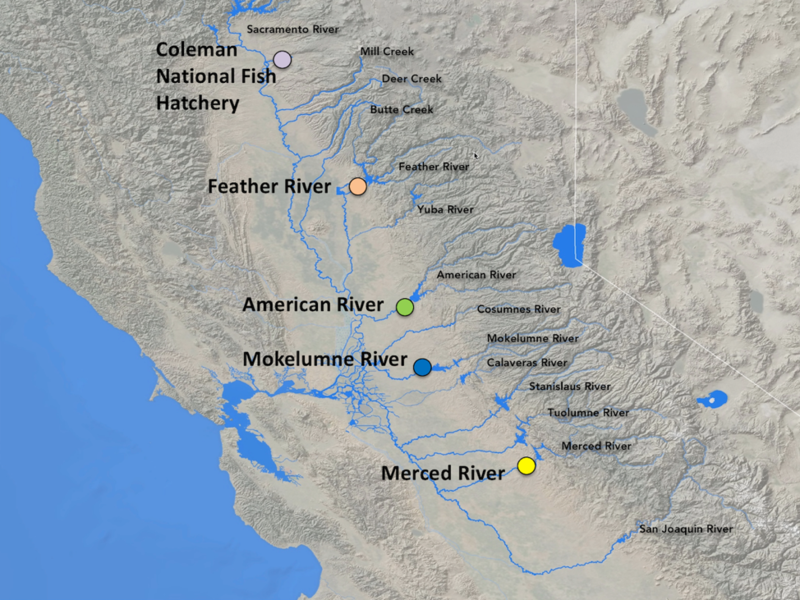 Hatchery influence on adult fall-run Chinook salmon returning to the Stanislaus and Tuolumne rivers. The proportion of fish marked with a clipped adipose fin and the estimated hatchery contribution are based on total counts from weirs on each river. No estimate from the Stanislaus weir was available in 2011 because the weir had to be removed early due to high river discharge. While a large number of returning adult salmon might seem to be a cause for celebration, in reality, the high contribution of hatchery fish masks the decline of wild spawners. A recent paper by Willmes et al. (2018) observed similar patterns with natural-area spawning fall-run Chinook on the Feather River. A primary concern about replacing wild populations of salmon with hatchery fish is an eventual loss of genetic diversity, a phenomenon known as the Ryman-Laikre effect (Ryman and Laikre 1991). Wild salmon have evolved unique adaptations to the specific requirements of individual watersheds, and such genetic diversity is important for helping a species cope with threats like climate change. However, most hatchery fall-run salmon are genetically similar, and through interbreeding with wild spawners, they can essentially “dilute” the salmon gene pool. Although hatcheries can inflate the number of fish returning to the San Joaquin Basin, the situation is really one of quantity vs. quality.